Anaxagoras of Clazomenae (circa. 500 B.C.-428 B.C.) was reportedly the first Presocratic philosopher to settle in Athens. He was a friend of Pericles and his ideas are reflected in the works of Sophocles and Aristophanes. Anaxagoras asserted that Mind is the ordering principle of the cosmos, he explained solar eclipses, and he wrote on a myriad of astronomical, meteorological, and biological phenomena. His metaphysical claim that everything is in everything and his rejection of the possibility of coming to be or passing away are fundamental to all his other views. Because of his philosophical doctrines, Anaxagoras was condemned for impiety and exiled from Athens. This volume presents all of the surviving fragments of Anaxagoras' writings, both the Greek texts and original facing-page English translations for each. Generously supplemented, it includes detailed annotations, as well as five essays that consider the philosophical and interpretive questions raised by Anaxagoras. Also included are new translations of the ancient testimonia concerning Anaxagoras' life and work, showing the importance of the philosopher and his ideas for his contemporaries and successors. 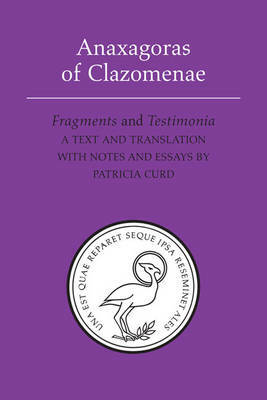 This is a much-needed and highly anticipated examination of Anaxagoras of Clazomenae, one of the forerunners of Greek philosophical and scientific thought.